The Age of Aquarius is the time when Technology, Science, Knowledge, and Industry will join with Love, Compassion, Harmony, Understanding, Reason, Wisdom and Mercy to bring about an age in which the human race will reach its potential, achieving both material and spiritual fullfilment and universal happiness. This will contrast sharply with the Age of Pisces, known by the Chinese as the Age of the Sword. The Mayans, who observed the cosmos for centuries, devised a calendar of some 26,000 years duration. This "long count calendar" came to an end on December 21, 2012; the start of cycle 13 in the Mayan calendar. The constellations of Pisces and Aquarius overlap; this is the Cusp. The ages do not begin abruptly, but fade in and out as the skies rotate. The influence of Aquarius is begining to be felt now, while Pisces slowly reliquishes its hold. But the time of the Cusp has ended; the calendar has turned to a new page, and the age of Pisces has concluded. 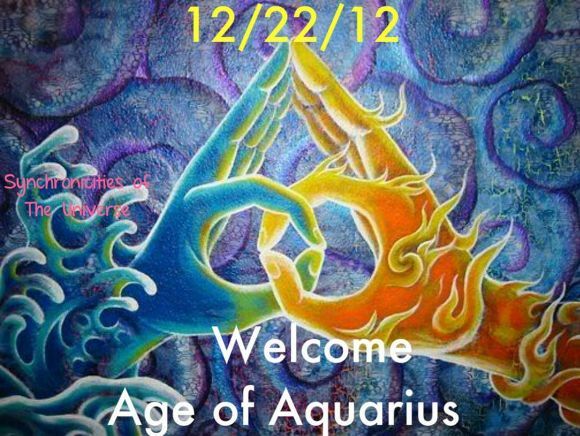 The time of change is strong now; an avalanche of events: The Age of Aquarius! Many aspects of Pisces will die hard. Wars, Exterminations, Exploitation, Genocide and the absolutism of Christianity will be with us for some time. Times of great upheavals, anguish, death and plagues will arise before we are fully into the promise of Aquarius. 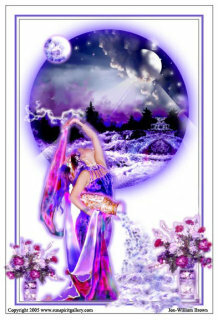 Aquarius: Water Bearer to the Gods. Water conveys the gift of life and is of special significance to Mithrils. Our rites include the Sharing of Water with our kin, and thus we partake of one of Nature's greatest gifts. Will you be an Aquarian? Will you forego the past, and enter with us into the Age of Aquarius? various graphics and pictures Copyright their respective authors.